This post is part of my ongoing series of helping theme authors out with building customizer fields that they need help with. This request comes from Nilambar Sharma. The closest I’ve seen to this is the Multiple Category Control from Theme Foundation. I sat down at the drawing board and got to work on a what I think is a good solution for any set of data using a similar method. This tutorial will assume that you’re accustomed to working with the Customization API in WordPress core. Create a new file called control-checkbox-multiple.php. As far as this tutorial is concerned, it’s sitting in the theme root folder. Feel free to put it in a sub-folder and organize how you see fit. Drop the following code into the file. * Multiple checkbox customize control class. * Displays the control content. There’s a couple of things to note about this class. The first is that I’m utilizing the enqueue() method. If you’re unfamiliar with this control method, it allows you to enqueue scripts/styles when a specific control is used. We’ll be loading a custom customize-controls.js file for this control. Assuming you’ve never loaded a control class, you might be surprised if you attempt to simply load the file in your theme. You’ll get a fatal error because the WP_Customize_Control class hasn’t been defined yet. This bit of jQuery looks to see when a checkbox value has changed. If it has, it adds/removes that value to the hidden input. It also let’s WP know that a setting has changed via .trigger( 'change' ), so that the customizer form can be saved. Admittedly, I’m not the greatest JS programmer, so please improve upon the code if possible. This is pretty standard for anyone who’s used the customizer. You need to add a setting and a control. You can use a multiple checkbox control for all sorts of things, such as choosing multiple categories or multiple pages. 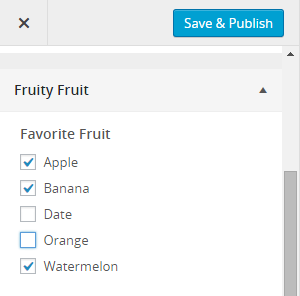 For the sake of this example, I’ll just have a “favorite fruit” setting to show how things work. Because we’re working with multiple values, you can’t simply throw in just any ol’ sanitizing function for the sanitize_callback argument. You’ll need a custom callback function to sanitize the values individually. Another thing to keep in mind is that because we used a hidden input element in our control, everything is stored as a comma-delineated string of values rather than array. So, we’ll need to turn that back into an array before the value is saved to the database. We can kill two birds with one stone with a custom sanitize_callback function. I’ve used array_map() in the function to run sanitize_text_field() over each value. Don’t just use that because I used it in this tutorial. Use the function most appropriate for the type of data that you’re sanitizing.